Asylum seekers who are placed in Glasgow could be allowed to work six months after their claim to stay in the UK has been submitted. The move is one of a series of changes which Glasgow City Council hopes to introduce in a UK pilot scheme. It would mean people could hold down a job until a final determination on their application is made. The Home Office has not agreed to the plan but said it was "carefully considering the recommendations". Glasgow currently has the highest number of asylum seekers in any UK local authority area. Currently, asylum seekers are not allowed to work in the UK unless their claim has been outstanding for at least 12 months through no fault of their own. The council insists its proposals would not lead to more people coming to Glasgow "as dispersal would still be managed by the Home Office". Glasgow hopes to introduce measures to make the process easier for asylum seekers and councils following a row over lock-change evictions. Housing provider Serco was criticised last summer after it announced plans to evict about 300 people who were refused the right to stay in the UK. The company later put the evictions on hold and has since lost its asylum accommodation contract for Scotland. BBC Scotland's The Nine spoke to one man in Glasgow who is awaiting a decision on his application for asylum. A former business consultant, he fled Saudia Arabia in 2017 fearing that his daughters may have been forced into arranged marriages. While he is unable to work until a decision is made on his application, he lives on £5 a day in benefits. The BBC has chosen to protect his identity. He said: "I felt safe the first night I came here, because nobody can touch my daughters, nobody can harm them. "The system at the moment, they need to look at it again and consider the situation by giving the chance to people who are qualified the chance to work so they don't have to pay for them." 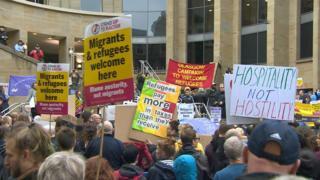 The Glasgow move follows the creation of a taskforce which also included the Scottish government, the Scottish Refugee Council, Cosla and the Home Office. The group has proposed a series of measures aimed at improving the relationship between local and national government and private contractors. An end to people being required to travel to England to make further submissions. Taskforce chairwoman and Glasgow City Council chief executive Annemarie O'Donnell said: "When people come to our city looking for help, Glaswegians want to ensure we do everything we can to assist them. "I am confident that the recommendations in this report, and the work that we will now do together, will allow us to do much more to support some of the most vulnerable people seeking asylum in the UK and in our city." Councillor Jennifer Layden is in London to host talks with the Home Office on the pilot scheme proposals. She addressed some of the arguments opposing to the proposals, particularly the idea that Glasgow already has a high rate of unemployment among residents who already have the right to work. She also agreed that a cap on the dispersal of asylum seekers may be necessary for Glasgow. Cllr Layden said: "We are trying to bring more business into Glasgow particularly around our financial sector and these are all things that I believe can help. We have a work force that is there, ready and willing to work - we should be utilising them. "At the moment we are one of the largest dispersal centres in the UK and one of the things we are talking about is we do need to have a cap on the figures, particularly with the fact that we don't receive enough funding to help us with the process. "We've been looking forward in taking on different processes and pathways to improve the asylum dispersal support system so I do think there is a willingness there to have the conversation. "What I will be pushing is that we take forward these recommendations." A Home Office spokesman said: "We take the wellbeing of asylum seekers and the local communities in which they live extremely seriously. "We have and will continue to work closely with Glasgow City Council and partners to ensure that those who are no longer entitled to asylum accommodation receive the appropriate advice and support. "The government is listening carefully to the complex arguments around permitting asylum seekers to work. "In December the Home Secretary committed to reviewing the current policy and this work is ongoing."